Psoriasis is a skin condition that causes skin cells to build up too quickly and form scales and itchy, dry patches. Research reported in the medical journal Drugs finds up to 40 percent of people with psoriasis will go on to develop psoriatic arthritis (PsA) within five to 10 years after being diagnosed with psoriasis. The skin lesions that commonly affect people with PsA are related to psoriasis. PsA is known for causing joint swelling and inflammation in the knees, ankles, feet, and hands. Joints may get painful, puffy, warm, and red. Stiff joints are common in PsA, especially in the morning upon waking. PsA may also cause pain and stiffness in the upper and lower back, neck and buttocks, resulting from inflammation of the spine and hip bones. If PsA affects the fingers and toes, these joints may take on a sausage-like shape. While rare, sometimes, inflammation in the fingers and toes can be destructive. Hand and finger deformities will make them harder to use. Toe and foot deformities will result in balance and mobility issues. People with PsA may also have fingernail and toenail problems, including dents and ridges in the nails. The same inflammation affecting the joints also affects the tendons where the muscles connect to the bones. For example, the Achilles tendon affects the heel of the foot and makes it harder to walk and go up steps. PsA inflammation may also affect the eyes, especially the iris, the colored part of the eye. And while rare, chest pain and shortness of breath affect some people with PsA. This is because inflammation may attack the chest wall, lungs, and aorta, the large blood vessel that extends from the heart. Skin problems in people with PsA are caused by psoriasis. Psoriasis causes red scales called plaques to appear on the skin, most often on the scalp, knees, elbows, feet, and lower back. They can be very itchy and painful and may bleed. While the plaques vary in size, they will join together to cover large areas of skin. There is more than one type of psoriasis, but plaque psoriasis is the most common. It is characterized by the gradual appearance of plaques on the skin. Other types of psoriasis affect the scalp and nails. While the skin symptoms of PsA will come and go, they tend to be associated with specific triggers. Triggers of PsA rash include stress, diet, cold temperatures, infections, and other illnesses. PsA and psoriasis have no cures. But people with both conditions can experience periods of remission where they will have little or no disease activity, including no skin symptoms. They can also experience periods of flare-ups where the disease and its many symptoms are active. Can PsA Occur Without Psoriasis? For many people with PsA, they will have had psoriasis for many years before developing PsA. However, there are cases where people develop PsA first. 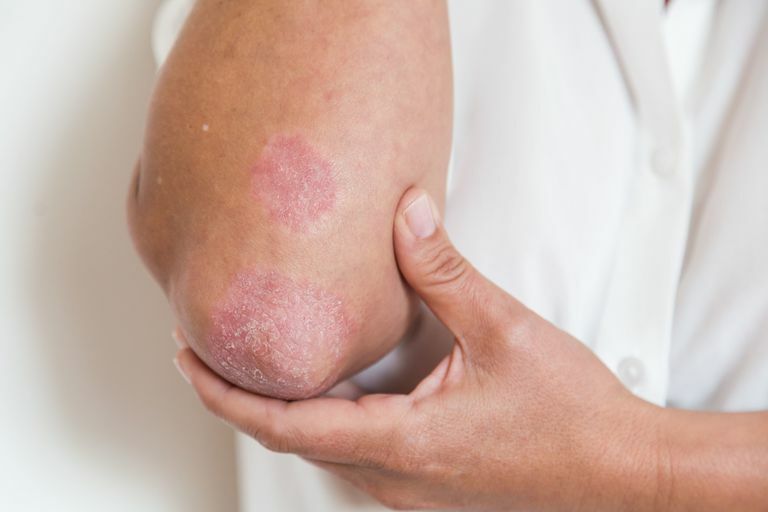 Research reported in the medical journal Annals of the Rheumatic Diseases finds as many as 29 percent of people with psoriasis may have undiagnosed PsA. PsA rashes look the same as psoriasis plaques. They appear as patches of red skin with silvery-white scales. These rashes may itch, burn, bleed, and hurt. It is important not to scratch these areas because there is a risk of infection and plaques may worsen. PsA rashes come and go and it is possible to have long periods where the skin is clear. Much like with psoriasis plaques, PsA rashes are triggered. The goal of treating PsA skin symptoms is to reduce plaque formation and keep skin cells from growing too fast. Preventing and reducing skin flares involves managing triggers, especially those related to diet and stress. Psoriatic arthritis is a chronic disease which has no cure. Symptoms will vary from person to person. How fast PsA skin rashes clear up will depend on how severe skin symptoms are and the effectiveness of treatment. It may take a while to find something that works to keep PsA skin symptoms under control. PsA rashes usually clear up. Most people will have periods of remission and periods of flare-ups. It is important to recognize and avoid triggers in order to reduce their frequency. The impact of skin symptoms can be lessened by controlling inflammation. DeVries C. Arthritis-health. Psoriatic Arthritis: A Skin Condition Gone Wrong. Updated July 24, 2017. Frank J. What Is Psoriatic Arthritis? Updated January 19, 2011. Haroon M, Kirby B, FitzGerald O. High prevalence of psoriatic arthritis in patients with severe psoriasis with suboptimal performance of screening questionnaires. Ann Rheum Dis. 2013 May;72(5):736-40. DOI: 10.1136/annrheumdis-2012-201706. Liu JT, Yeh HM, Liu SY, et al. Psoriatic arthritis: Epidemiology, diagnosis, and treatment. World J Orthop. 2014 Sep 18; 5(4): 537–543. DOI: 10.5312/wjo.v5.i4.537. Mease PJ, Armstrong AW. Managing patients with psoriatic disease: the diagnosis and pharmacologic treatment of psoriatic arthritis in patients with psoriasis. Drugs. 2014 Mar;74(4):423-41. DOI: 10.1007/s40265-014-0191-y. National Psoriasis Foundation. Could You Have Psoriatic Arthritis? Know the Signs. Psoriasis Speaks. What is Psoriasis? What Exactly is Psoriatic Disease?